Each week, more than 1,000 HCZ children—from pre-schoolers to high-schoolers—use the state-of-the-art, 50,000-square-foot Harlem Armory. 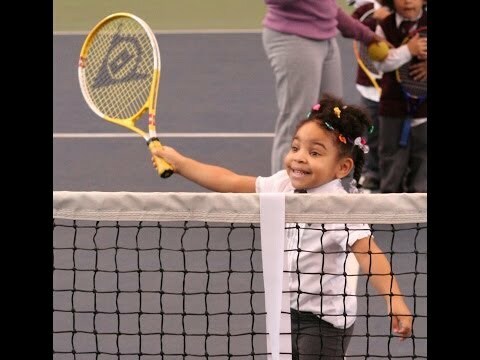 Our Harlem Gems® have fun tumbling and learning the basics of golf and tennis, while our older students can run track, play volleyball, and use the rock-climbing wall. Our stellar staff coordinates a wide array of physical activities for our kids, including, soccer, flag football, basketball, European handball, floor hockey and weight lifting. The Armory also is home to HCZ’s award-winning track and field, tennis, golf, and gymnastics teams. In the evening, hundreds of adults from the local community come to the Armory for Zumba, aerobics, yoga, circuit-training, gymnastics, and dance classes. Families also participate in on-site cooking classes to help them develop and maintain healthy eating habits to complement their workouts. The Armory has become a centerpiece of our groundbreaking Healthy Harlem initiative, helping us to combat the epidemic of childhood obesity in Central Harlem by serving the community at scale. Through our wide range of programming, we are effectively increasing both physical activity and nutrition know-how among our students and families so they can establish healthy habits and live long, happy, productive lives.